The witty town motto, “Cows, Colleges and Contentment,” established in 1914 accurately describes the past and present commitment of Northfield’s community to higher education and agriculture. In a productive combination of these two defining features, St. Olaf College bought hundreds of acres of agricultural land during the early 20th century and has shaped them throughout the years to become the ecological learning experience they represent today. Between 1880 and 2013, farming techniques and the use of land in Northfield as well as throughout Minnesota have changed drastically. These changes are due not only to the economic trends determining necessary crop yields, but also to an increased demand by the environment and by communities for more sustainable practices in farming. Besides occasional controversies between developers, farmers and environmental thinkers, Northfield’s citizens have shown consistent respect for the town’s deep agricultural roots in their preservation attempts and personal values. The successes and failures along the environmental history timeline of the St. Olaf Agricultural Lands strongly correlates with that of the rest of the farmland in Northfield and throughout Minnesota, but at a more forward-thinking level due to the motivation of college students, faculty and town members dedicated to sustainability. When John Wesley North settled the land that would become Northfield in 1855, he was well aware of the abundant natural resources it provided that would help build the economy and town population. The area had recently been surrendered by members of the Dakota tribe so the new inhabitants were able to create plans with very little external input. For the first few decades of Northfield’s growth, the agricultural community focused on the production of wheat. Of the 800 farms in Rice County, about one-third of them harvested wheat. This was parallel to the 30,855,031 acres of wheat as compared to the 620,955 acres of corn throughout Minnesota farms in 1886. During the 1880’s in Northfield, however, the economic value of dairy farming shifted farmers’ attention to cattle. Innovations in cattle-breeding with Holstein and Percheron cows aided in Northfield’s economic growth. Stemming from marketable products of the town’s first creamery built by Whittier and Hunt in 1879, Northfield became known for its commercial milk processing industry. One dedicated individual named William F. Schilling promoted Northfield’s dairy farming capabilities throughout Minnesota in newspaper articles and by word of mouth, further strengthening the significance of agriculture for the community. The expansion of railroad tracks in the wider Midwest during this time increased the availability of and demand for foods processed far from home. Just as fruits could travel from California to Iowa, Northfield’s evaporated milk brand found consumers in Minnesota’s Twin Cities. This change in national consumption directly benefitted Northfield’s agricultural industry. By 1916, many major town events were tied to the celebration of the farm community and its relevance to daily life. newly increased use of federal aid parallels the general economic trends of the time. Between 1950 and 1990, new industries took the place of old creameries and widespread agriculture but the sense of community devotion still remains. Following this demoralizing era, emphasis was placed on the costs and benefits, environmental impacts and economic issues of growth. 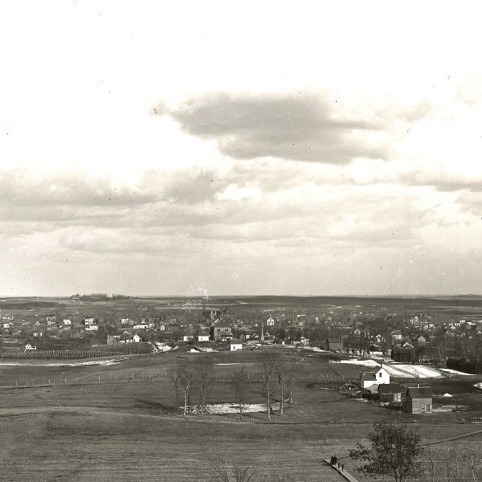 Such changes urged St. Olaf College and Carleton College to buy significant areas of farmland to develop, restore, or cultivate. students of St. Olaf were and are still very interested in keeping agriculture a part of the culture in Northfield. This was exemplified in 1975 when a developer offered the college a substantial amount of money to make gravel pits on their lands. The most economically beneficial area for building, however, was in the middle of the agricultural lands near a freshwater spring. After much debate, St. Olaf decided to turn down the offer in favor of protecting the integrity of the land. In the early 1990’s, about 300 acres of the St. Olaf Agricultural Lands were re-tilled to become prairies called the Natural Lands. St. Olaf College applied to be a part of the Conservation Reserve Program at this point to give compensation to the farmers who had been working on this land. In this benefit program, annual payments are given to farmers who convert their environmentally sensitive land to tame or native grasses, trees, or other vegetative cover practices. This way, farmers are still making money to live but are not contributing to environmentally unsustainable practices. Aid is given in 10-year contracts, which the original farmers have reapplied for and received. The other 400 acres of land St. Olaf’s land were rented to local farmers to till and sell the crops. At this point, most fields were using a corn-on-corn system which, according to Dr. Bakko, is “the worst kind of agriculture,” in terms of its effects on the soil. With the help of faculty and students of the Environmental Studies and Biology majors, St. Olaf was able to convert 44 acres of land into a more sustainable system in 1993. This system involves four crops on a five year rotation of corn, soybeans, oats/alfalfa, alfalfa, alfalfa. Low-impact farming practices such as this refer back to early Native American lifestyles. Food production was focused on the long-term use of the land rather than solely maximizing crop yield. In 2004, this rotation system was extended to all the agricultural land owned by St. Olaf, including its farm renters. This method is much more environmentally sustainable due to its no-till policy and allows students to study innovative agriculture without having to travel far from campus. ut the students and faculty living in Northfield, “perhaps their greatest contribution to the town has been the free and ready participation in its affairs.” The relationship between St. Olaf’s students and Northfield’s agricultural lands, therefore, equally benefits both communities. Such interconnectedness with the land is reminiscent of Griffith Pinchot’s conservation-through-use stance. While aesthetic qualities of land are important in promoting preservation, efficient usage provides “the greatest good for the greatest number,” as explained by Pinchot. The productivity of St. Olaf Agricultural Lands protects nature for more reasons than its beauty while providing for the community. past. The Northfield’s Comprehensive Plan published in 2008 outlines how citizens will manage growth and change throughout the community in the long term. The section titled, Environmental Resources, asserts that “conservation farming practices should be encouraged in the city’s growth areas as a means of reducing soil loss in agricultural fields. Also, the rate of growth should be controlled…to reduce the amount of land taken out of agricultural production.” In other words, Northfield as a whole commits to following the lead of St. Olaf College in preserving the integrity and rightful usage of its agricultural lands. While discussion of growth later in the plan admits that some agricultural land may eventually be developed, this dedication to protecting Northfield’s productive soils alludes to a community still deeply connected to their farming roots. From 1855 to the present, the citizens of Northfield have worked alongside college students and faculty members to maintain and improve the farming practices which still play an integral role in their identity. The town’s economic development was highly affected by the contributions of its two colleges as well as the shifts in agriculture. Beginning as a wheat-focused group, the farmers of Northfield have been flexible in shifting to dairy farming, corn production, and, most recently, no-till crop rotations of corn, oats and alfalfa throughout the years. This flexibility highlights the societal values of building and strengthening the community with high regard to economic trends, environmental impacts, and respect to farmers. The ideals of St. Olaf students have also played a role in the preservation of agricultural lands, especially when considering the changes in the St. Olaf Agricultural Lands. Dedicated individuals have done research on the best methods of farming and then applied these techniques to the land as a mutually beneficial large-scale science experiment. Following this example, Northfield has committed to using increasingly sustainable methods of farming in the future to preserve the quantity and quality of the agricultural lands which shaped the town’s past. “Northfield: minnesota at its best,” Northfield Convention and Visitors Bureau, accessed May 17,2013, http://www.visitingnorthfield.com/history.html. Lynn Carlin, Continuum: Threads in the Community Fabric of Northfield, Minnesota (Minnesota: City of Northfield, 1976), 43. “Agriculture in Minnesota,” New York Times, August 28, 1886, accessed May 17, 2013, http://search.proquest.com/docview/94454013/fulltextPDF?accountid=351. Northfield Heritage Preservation Commission, Northfield: The History and Architecture of a Community (Northfield: The Commission, 1999), 11. Ted Steinberg, Down to Earth: Nature’s Role in American History (New York: Oxford University Press, 2006), 173. Neil Maher, “Crazy Quilt Farming: The Great Depression, the Soil Conservation Service, and the Politics of Landscape Change on the Great Plains during the New Deal Era,” The Western Historical Quarterly (2000): 320, accessed May 17, 2013, http://www.jstor.org/stable/969963. NHPC, Northfield, 16 and 35. Eugene Bakko (former Curator of Natural Lands for St. Olaf College), interviewed by Haley Flom, April 15, 2013, audio recording. Steinberg, Down to Earth, 17.
of cropping and tillage patterns on soil, water, energy use and productivity,” Renewable Agriculture and Food Systems (2004): 81-82, accessed May 17, 2013, doi: 10.1079/RAF200493. “The National Parks: America’s Best Idea,” WETA and Florentine Films, accessed May 17, 2013, http://www.pbs.org/nationalparks/people/historical/2/#pinchot. “Comprehensive Plan for Northfield,” Greg Colby et al, accessed May 17, 2013, http://www.ci.northfield.mn.us/DocumentCenter/View/321. “Agriculture in Minnesota.” New York Times. August 28, 1886. Accessed May 17, 2013. http://search.proquest.com/docview/94454013/fulltextPDF?accountid=351. browse.php?CISOROOT=%2Farchives (accessed April 3, 2013). Bakko, Eugene (former Curator of Natural Lands for St. Olaf College). Interviewed by Haley Flom. April 15, 2013. Audio recording. Braker, Nancy. “Carleton College Cowling Arboretum.” Last modified May 13, 2013. http://apps.carleton.edu/campus/arb/. Carlin, Lynn. Continuum: Threads in the Community Fabric of Northfield, Minnesota. Minnesota: City of Northfield, 1976. Colby, Greg et al. “Comprehensive Plan for Northfield.” Accessed May 17, 2013. http://www.ci.northfield.mn.us/DocumentCenter/View/321. Gregory, Megan M., Shea, Kathleen L. and Bakko, Eugene B. “Comparing agroecosystems: Effects of cropping and tillage patterns on soil, water, energy use and productivity.” Renewable Agriculture and Food Systems (2004): 81-90. Accessed May 17, 2013. doi:10.1079/RAF200493. Maher, Neil. “Crazy Quilt Farming: The Great Depression, the Soil Conservation Service, and the Politics of Landscape Change on the Great Plains during the New Deal Era.” The Western Historical Quarterly (2000): 319-339. Accessed May 17, 2013. http://www.jstor.org/stable/969963. Northfield Convention and Visitors Bureau. “Northfield: minnesota at its best.” Accessed May 17,2013. http://www.visitingnorthfield.com/history.html. Northfield Heritage Preservation Commission. Northfield: The History and Architecture of a Community. Northfield: The Commission, 1999. Steinberg, Ted. Down to Earth: Nature’s Role in American History. New York: Oxford University Press, 2006. St. Olaf College. “St. Olaf College Natural Lands.” Accessed May 17, 2013. http://www.stolaf.edu/academics/naturallands/agriculture/. USDA. “USDA, Farm Service Agency.” Last modified May 14, 2013. http://www.fsa.usda.gov/FSA/webapp?area=home&subject=copr&topic=crp. WETA and Florentine Films. “The National Parks: America’s Best Idea.” Accessed May 17, 2013. http://www.pbs.org/nationalparks/people/historical/2/#pinchot.